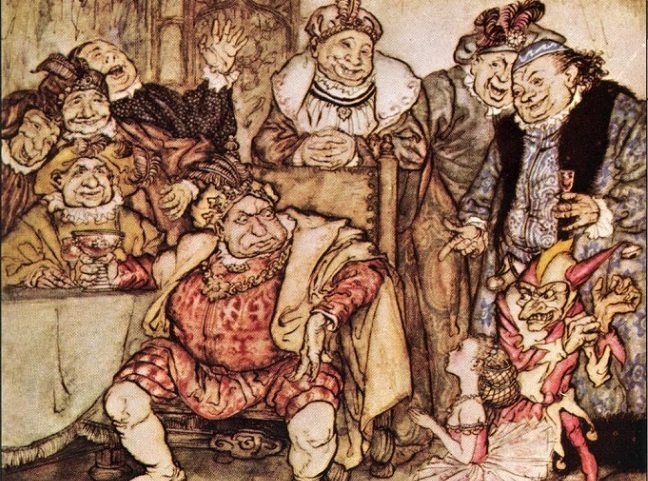 Hop-Frog, Trippetta, the King and His Councilors, by British book illustrator Arthur Rackham (1867–1939), from a 1935 edition of Poe’s Tales of Mystery and Imagination. Image courtesy of Wikimedia Commons. The 5 prose pages I finished yesterday are called—what do you think? —I am sure you will never guess—Hop-Frog! Only think of your Eddy writing a story with such a name as “Hop-Frog”! . . . It will be published in a weekly paper, of Boston, called “The Flag of Our Union”—not a very respectable journal, perhaps, in a literary point of view, but one that pays as high prices as most of the Magazines. Poe had written often of his disgust at the sensationalist fiction of the day, yet he found it necessary to publish in the very journals he detested in order to finance his other projects and just to pay the bills. “Hop-Frog,” notes Paul Gilmore in a recent study, “was Poe’s attempt to cash in on the public's demand for sensational tales in order that he might escape that very public.” Yet, unlike contemporary novelists such as George Lippard or William Gilmore Simms (whose “villainously bad taste” Poe decried), “Poe at his best brings order and control to the horrific or sensational. He carefully sculpts terror, using controlling devices such as the first-person narrator, understatement, and singleness of effect,” argues David S. Reyolds in a recent online assessment of the reasons Poe’s “sensational” stories are held today in such high regard while others from the era are ignored. Scholars have long discussed the resemblances between the dwarf-jester Hop-Frog and his victims, on the one hand, and Poe and his critics, on the other. The king, biographer Kenneth Silverman points out, sounds very much like an editor, demanding “characters—characters, man . . . something novel—out of the way.” Hop-Frog’s name “was not that given to the dwarf by his sponsors at baptism” and his tone with the king alternates between impertinence and subservience; Poe himself was orphaned as a child and raised by the Allan family, and his letters to his foster father, from whom he was eventually estranged, switch between “insolence and cravenness” (to borrow Silverman's phrase). And the tale conveys Poe’s problems with substance abuse; alcohol “excited the poor cripple almost to madness” and its effect “on his excitable brain was not more powerful than instantaneous.” Yet when Hop-Frog proclaims to the crowd, “this is my last jest,” Poe had no way of knowing how close to the truth this last autobiographical detail would be. I never knew any one so keenly alive to a joke as the king was. He seemed to live only for joking. To tell a good story of the joke kind, and to tell it well, was the surest road to his favor. Thus it happened that his seven ministers were all noted for their accomplishments as jokers. They all took after the king, too, in being large, corpulent, oily men, as well as inimitable jokers. . . . If you don't see the full story below, click here (PDF) or click here (Google Docs) to read it—free! I've always found "Hop-Frog" interesting mainly because I find it, (along with "The Lighthouse,") atypical of his usual style. I generally get pretty irritated with efforts to find autobiographical meaning in Poe's work, but I have to admit that it's difficult not to wonder if, in this story, he wasn't writing about himself to a certain extent. Considering all that had happened to him in the previous few years, one has to wonder if he wasn't fantasizing about taking his revenge on his persecutors and escaping with "Trippetta" (his lost Virginia?) to some other, better world. Bizarre and unsettling. Loved it!!! Thank you for sharing!